The closest Thai friend I’ve made so far was Ti (pronounced “Tee”). Ti was my host brother when I was still in training in Ayutthaya. Ti is 37-years old with a wife and two little girls. He and his family live on an attached room to his parents’ home in the tambon of Sam Bandit outside the amphur of Uthai. I’ve been thinking of what to write in this blog for over a week and the only thing I’ve written is the paragraph above. I’m starting to realize how difficult it is to describe the great Ti if you’ve never lived in Thailand or met him. Much like the rest of the country, Ti is always happy … always. Even when his wife was screaming from another room, I’d raise an eyebrow to Ti and he’d simply smile and shake his head as if to say, I’m used to it. If I didn’t laugh it off, I’d have an ulcer. She wasn’t like this before we got married. Ti’s wife, Joy, was a great lady, but had a voice that could make dogs howl. Ti loved to tease me about any woman I talked about. He was like the older brother I never had. In the last three weeks, Erin and I spent a lot of time together and much of that time was in the presence of Ti. One evening after she left, Ti, in his hilarious broken English said, “Jeff … Erin … happy!” This is followed by his shy, giggling laugh that would fit perfectly amongst a group of fourth graders talking about kissing girls. Whenever I mentioned that I was going to see Erin (during training she lived a five-minute bike ride away) to Ti, he’d give off a, “Oooooooohhhhhh!” as he backed away from me and then followed that my giggling and pointing at me. It was a really hot day and I did not feel like wearing a shirt and wondered if it was okay not to in Thai society. My question was quickly answered when I came downstairs and found Ti sans shirt. Occasionally Ti knew I was a 32-year old guy who can only take so much of the domesticated home life and would invite me to have dinner and beers with a friend of his or sometimes just the two of us. It was during one of these trips I not only had a great time with Ti, but realized my Thai must be getting better because we talked for two hours over beers and fried rice. He even made the owners of the restaurant play American music for me. Occasionally, Ti would break out a beer or two at home. Ti also loved hanging out at the farang table. This was the table the giant parties would designate for us farangs (foreigners), always way too close to the speakers. All the Peace Corp trainees of the village would sit at this table and Ti would be on the only Thai person there. He didn’t care that we spoke poor Thai and he only knows a few English words. He still sat there and made sure everyone had enough food and whiskey and took all of our teasing to heart. Although, he was pretty good at sending it back. I used to love when he would try to teach me Thai and I’d purposely screw up something simple just to hear him say in frustration, “Mai chai! (Not correct)”. I do hope to visit Ti and the rest of the family in the next two years. I really don’t feel this is a good blog because I don’t feel I’ve conveyed how cool Ti is, but I thought I owed a tribute to him. 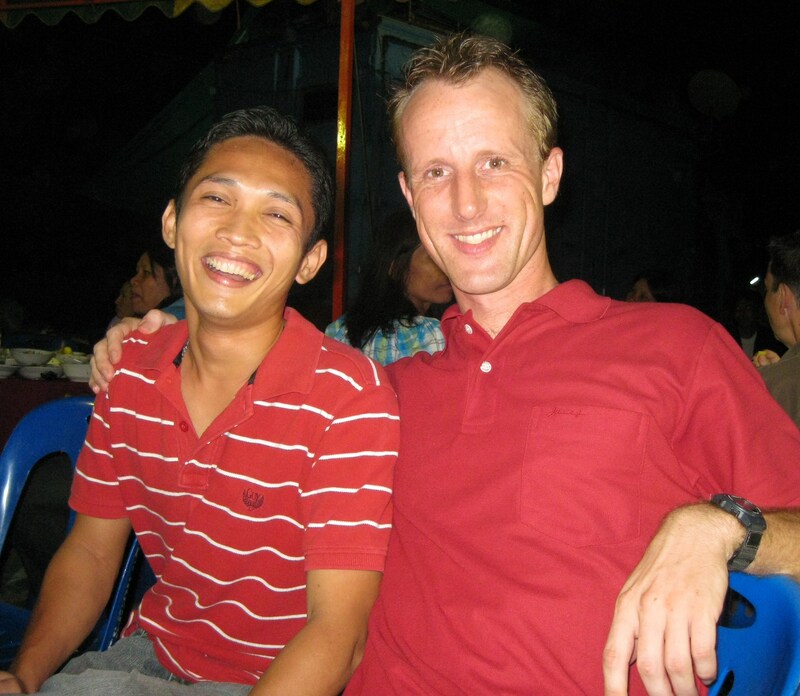 Ti was my first Thai friend and I truly appreciate how welcoming he was to a complete stranger from another world.